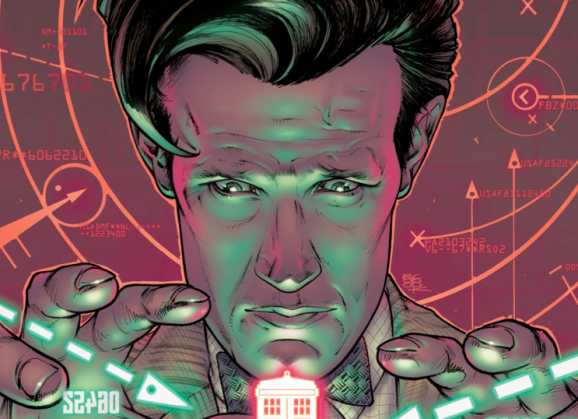 This issue of Doctor Who: The Eleventh Doctor, #8, “The Infinite Astronaut, as well as the previous one, have made a big deal about this being a two-part affair. What this really does is drive home the difference between this Titan Comics title and the other two current Doctor runs—The Tenth and Twelfth Doctors. Both of those comics have, thus far in their youngish runs, only unveiled their arcs across multiple issues, even as many as five or six to fully wrap a story up. This is one of the biggest fundamental differences, and with such a truncated narrative approach, it’s been difficult to get as invested in The Eleventh Doctor as the other two. And while this two-parter is a move in the right direction, it’s not a particularly big step. We find the Doctor, and his band of weirdo misfit travelling companions—future past rock star Jones, the creature known as ARC, and, of course, former librarian assistant Alice Obifune—in the same situation as they were when the last issue ended. They’re in the middle of a never-ending space war that they need to stop before it costs any more lives or engulfs the Earth—and you know how the Doctor feels about war. ARC and Jones are all kinds of messed up, writhing on the ground in pain and existential despair that leaves them both in their respective versions of the fetal position. And while that is going on, Alice has a surprise for the Doctor, her dead mother has miraculously come back from the dead. Or at least that’s what Alice thinks; the doctor, not so much. This sets off the main emotional conflict of the issue, as Alice tries to compute what the Doctor tells her and what she sees in front of her, between hope and reality. In this sense, “The Infinite Astronaut” is much more somber and emotionally brutal than anything we’ve encountered up to this point in The Eleventh Doctor. It’s a hard thing for Alice to cope with, and by the time and Jones fly through a portable wormhole to seek out the origins of this endless war—like so many conflicts, it goes back to contradictory ideas about god—she may be irrevocably broken. Ironically enough, this state of mind, this overwhelming sadness serves her well on her adventure to another dimension. This story is about hope in the face of hopelessness, and the pain that optimism can cause. Especially compared to the rest of the run on The Eleventh Doctor, this is an especially bleak, desolate narrative, almost the polar opposite of the bright bounciness we’ve seen up to this point. Though you’re way more invested in the characters, you feel their sadness and worry, it’s almost an overcorrection in the other way. Still, it’s as good an issue as this version of the Time Lord has had yet, and though this is marketed at a two-part affair, there is more to come in this arc. This move is indicative of this creative team is moving into a larger format of storytelling, something the other two series both adopted right out of the gate, and it will hopefully give the stories and characters the necessary room to develop and grow. Are you guys okay? I worry. No updates for several days. Maybe they didn’t pay their bills? Nope, just out of town for a few days. We’ll be back to full stomping capacity today! Gotta keep that robot charged. For the love of god, KEEP THE ROBOT CHARGED! SU-PER-MAN!! !